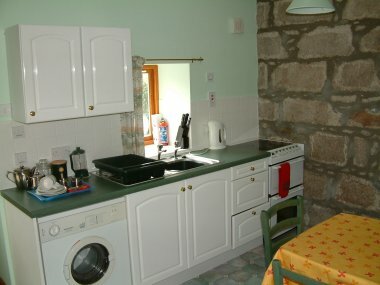 Two unique self-catering cottages near village centre with all its amenities. Pine Tree has a decked patio with sunny aspect; Sycamore was built recently to a high standard with underfloor heating & wood-burning stove. 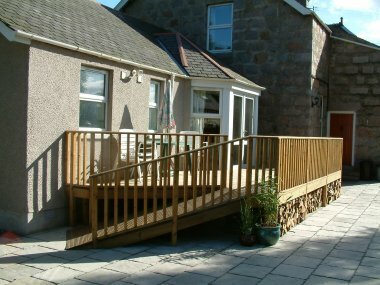 Both cottages are one-bedroomed & ideal for couples but Pine Tree sleeps 2+1; Sycamore sleeps 2; bed-settee/fold-down bed for one also available in both at small surcharge. Free wi-fi. Strictly non-smoking; sorry, no pets. We are only a small business however we have many returning visitors. Visitor book comments inc. "Here we are back again for the seventh time, it is just like coming home. 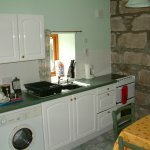 The cottage is just as good as ever, clean, warm & cosy". Ballater still has village pubs, a Bank, a Tourist Office & Post Office as well as an enticing deli and the award-winning Butchers, Sheridans, not to mention varied & interesting restaurants, cafes & shops, many with Royal warrants. (The village was also home to the Old Royal Railway station sadly recently destroyed by fire). There are many other castles in the area and the Royal Lochnagar Distillery. For energetic days, there is golf at the Ballater course & in neighbouring villages, cycling (bike-hire in village), fishing, hill-walking, mountain climbing or even skiing, weather permitting. For nature enthusiasts there are reserves locally inc. the Mar Lodge estate featured on Winterwatch. We do not have online booking but please contact us by email, phone or text. Thank you. We take great pride in providing a personal service and doing what we can to make sure you enjoy your stay. We are always willing to help where possible and several visitors have commented on this. As yet we do not have our own website but have many visitors returning or recommending us to their family and friends, as well as new clients. 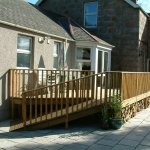 In addition, we signed up several years ago to the VisitScotland Quality Assurance Scheme which independently assesses properties for their grading award. This and membership of the ASSC gives visitors the peace of mind they need before making a booking. There is no agent involved so our rates are competitive given the 4 star rating of the cottages and their central village location. We are only a small business however we have many visitors who come back year after year, quite a number for over five years. Recent visitor comments include "It is perfect, it's so clean and tidy! (I'm a stickler for clean and tidy so it's made my day!)" Finally, the cottages are less than a minute's walk from the local Tourist Office where you can get all the information you need to make the most of your stay.